Happy New Year Friends! We love new beginnings! Every new year comes with its own exciting new beginnings. It is highly probable that you have filled 2019 with good-for-you goals that essentially mark the new beginnings. A commitment and a resolve to showcase a better version of you. I have a suggestion for you and especially for women. That you make the pursuit of health and wellness a priority this year. We would like to start you off with wellness tips and important information on cervical cancer in the next two articles. 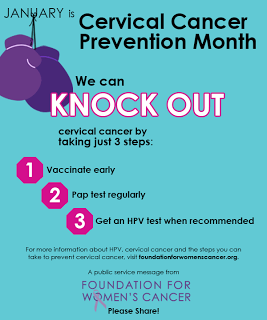 The cervical health awareness month gives an opportunity for the world population to raise awareness on how women can protect themselves from the Human papillomavirus (HPV) and cervical cancer. HPV is not an uncommon infection. Its viral spread is achieved through sexual activity and it claims the responsibility of near-to-all cases of cervical cancer. The major downside of the virus is that many people infected by it would never know of it. The World Cancer Research Fund in collaboration with the American Institute for Cancer Research, run a continuous update project that analyses research on cancer prevention and survival. According to their analysis, Cervical Cancer is the eigth most common cancer worldwide and the fourth most commonly occuring cancer in women. Virtually all cervical cancers are associated with the human papillomavirus (HPV). However, the majority of women with HPV do not develop cervical cancer. Women become susceptible to developing cervical cancer following HPV infection, but other environmental factors are required for the cancer to develop in addition to age and greater body fatness. The list below shows Swaziland and Malawi leading the top 20 countries with the highest rates of cervical cancer in the year that has just ended. The statistics above may not seem to give any hope to a population that is seeking wellness. However, there is some good news. And the good news is that survival rates greatly increase and the infection can be completely done away with, with enough awareness on the virus. Two important facts back up this claim. That there is a vaccine against the Human papillomavirus (HPV). Shots of the HPV vaccine can prevent HPV. Also, Cancer of the cervix can often be prevented with regular screening tests and good follow-up care. The pap screening tests help detect abnormal or malignant cells well in time before they turn cancerous thus prevent death. The January Cervical Health Awareness Month Makes Such A Significant Difference! This is an opportunity for us to help our women achieve better health in 2019. Our mothers, wives, sisters, daughters, aunties, nieces, colleagues friends. They are all part of the large family that we need to keep for as long as the Deity allows us. We can take advantage of the month to spread the word about vital steps women can take to stay in good shape physically, emotionally and socially. Talk to every woman in your life about how important it is for them to go for a screening test. Urge the parents to take all pre-teens, both boys and girls for the HPV Vaccine.